A cookie is a small, flat, baked treat which typically contains egg, fat, flour and sugar. The word cookie derives from the Dutch word koekje which literally translated means little cake. This Christmas season, host your own cookie trading party. 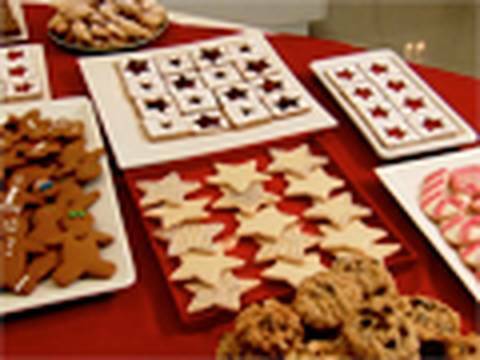 Here are some starter recipes for fun Christmas cookies that you can bake at home. These melt in your mouth classics can be made from your cut outs or rolled into balls. Roll the balls in your favorite topping, such as crushed almonds or coconut. Christmas balls are the easiest fun Christmas cookies you can make. Mix well, roll out in to about 1/4-inch thick, and cut into shapes. Alternatively, roll into small balls then roll in finely chopped nuts or coconut; place on lightly greased cookie sheet and flatten with the bottom of a glass. Bake at 300° F. for approximately 20 to 25 minutes. Fun Christmas cookies with a surprise chocolate kiss wrapped inside. This recipe makes about two to three dozen secret kiss cookies. Cream together the butter, sugar, and vanilla and then blend in the flour. Wrap one tablespoon of dough around each chocolate candy kiss. Bake at 350° for about 15 minutes, or until the dough is set but not browned. Roll each cookie in powdered sugar while still warm. Beat butter with an electric mixer at medium speed until creamy. Add sugar and the next three ingredients, blending well. Chill dough for 2 1/2 hours in the fridge. Roll the dough into small balls, then roll in the chopped nuts. Place on lightly greased cookie sheets. Make an indention in the middle of each cookie and fill with jam. Bake at 300° for about 25 to 35 minutes, or until firm and lightly browned on the bottom. These cookies make a great classroom treat. This recipe will make two dozen cookies. Cream the shortening and butter and mix in the sugar, egg, almond and vanilla. In a separate bowl, mix the flour, salt together, and add to the shortening mixture. Divide dough in half. Blend red food coloring into one half. Roll 1 teaspoon of the red dough and 1 teaspoon of the white dough on lightly floured board into 4-inch strips. Place strips side-by-side, press lightly together, and twist. Do not pinch. Curve top of rope down in to the shape of a candy cane. Make one complete cookie at a time. If the dough of one color is shaped first, the rolls will become too dry to twist. Bake for 9 minutes or until lightly browned. Remove while still warm. Sprinkle with 1/2 cup crushed peppermint stick candy and 1/2 cup sugar (optional). In a small Pyrex bowl over a saucepan of hot but not boiling water, melt 1/2 cup of the chocolate chips and leave to cool. Beat the butter, shortening and sugar until fluffy and then beat in the eggs one at a time. Beat in the vanilla followed by the melted chocolate. In a separate bowl, stir the flour, cocoa, baking powder and salt and then stir that into the butter mixture. Stir in the cherries and remaining chocolate chips. Drop by tablespoonfuls about 2 inches apart onto greased baking sheets. Bake at 375 degrees for about 12 minutes or until edges are, firm and centers still soft.